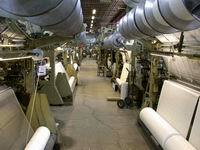 It is used to prepare the yarns that are going to be used by the warp knitting machine to produce warp-knit fabrics. This is a set of installed warp beams as seen from behind. Knitting machine with warps installed. This is where the fabric is produced. High-density Polyethylene slitter in operation.